It’s Wednesday, and that means the MTA board will finally decide whether it will accept the blame for a fare hike, or vote it down, and try to cast the blame on Gov. Cuomo, who hasn’t established a long-term funding scheme for the cash-strapped agency that just happens to keep our city functioning. David Meyer did a nice analysis of the impasse, in case you missed it. And our December Donation Drive continues (hint). Car carnage in the Bronx. This time, a 6-year-old is the victim. (NYDN) There was also a fatal hit-and-run in Gravesend. Brooklyn Borough President Eric Adams and Council Member Mark Treyger will go to the intersection of Avenue Y and West Second Street to mourn 56-year-old victim Francine LaBarbara and complain about speeding drivers. And, finally, we don’t get to link to The Onion very often, but America’s finest news source hit the nail on the head in its spoof of federal Transportation Secretary Elaine Chao. The Soundview Ferry parking issue in Clason Point. There’s only one location where a parking lot could be built, and it is directly adjacent to the terminal on a vacant lot. 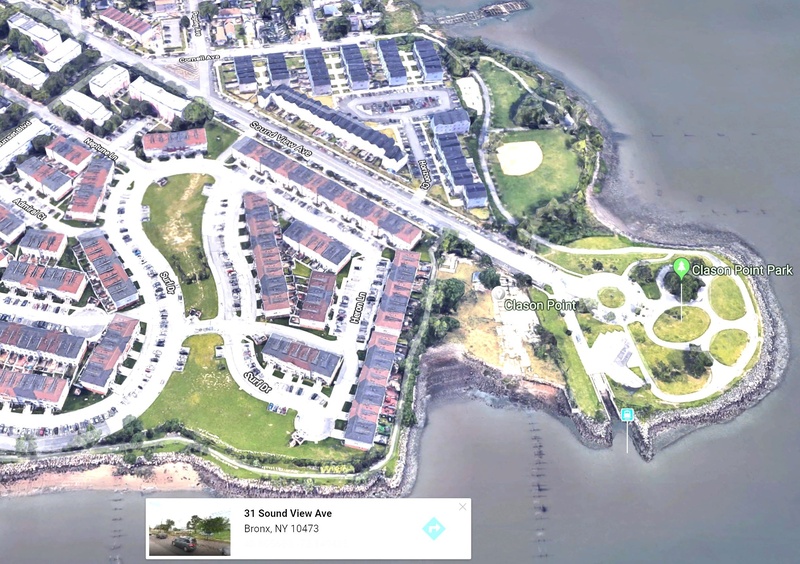 That’s the only location that makes sense to allow a quick walk to the ferry, and it would have to be multilevel to put any dent in parking issues, which means killing views for the residents of Shorehaven. Terrible land use planning down there overall. The city also needs to redesign the entrance to the park to allow for the U-turning of the articulated bases that the Bx39 bus uses. The park in general could use a big update. And the bicycle parking should have been sheltered. The city just added a measly multi-bike rack you would find on a sidewalk. Not even corral style. The city also needs to redesign the entrance to the park to allow for the U-turning of the articulated buses that the Bx39 uses. The park in general could use a big update. And the bicycle parking should have been sheltered. The city just added a measly multi-bike rack you would find on a sidewalk, not even corral. Coning off street space for parking is at least as outrageous as fare beating on public transit. Has NYPD ever arrested anyone for it? It’s rather absurd that the people doing it can go get their cones back with proof-of-purchase. The cones seem like evidence to me. It’s true that drivers are subsidized, and that the total subsidies are far more than those for transit. However, Americans drive a STAGGERING distance every day. When divided by the distance driven, subsidies per km for driving are a lot lower than for transit. $/km is not a great way to measure subsidies, since transit trips tend to be shorter by nature, and subsidizing driving simply encourages more of it. I strongly suspect that Americans would not drive nearly so far if they had to pay more of the variable costs. There are plenty of good reasons for transit, and driving subsidies are certainly not even per km across the entire network. But at first glance, complaining about automobile subsidies is a poor argument because on average they really are very low. > I strongly suspect that Americans would not drive nearly so far if they had to pay more of the variable costs. This is a different issue entirely… the idea that once you’ve sunk fixed costs into a mode of transportation, you’re likely to choose it more. That has nothing to do with subsidies. Do the math, and the federal transportation budget gap could be closed by raising gas tax about $.80/gal. Sure, that’s a political non-starter in our driver-obsessed world. But it’s still only about $.03/mi, compared to the $.60/mi that average drivers pay for everything. So we’re talking about a 5% subsidy here on the cost of driving, compared to 400% average subsidies for transit. Even accounting for shorter / more congested / higher value typical transit trips, I think it’s still REALLY hard to justify transit solely on the basis of driving subsidy numbers. Would drivers drive less if gas were $.80/gal more expensive? We already know the answer to this, since gas was $.80/gal (at least) more expensive in the recent past: they would drive just a tiny bit less, and they would want to buy cheaper, more fuel-efficient cars. Both of which are good things, but none of which would change the fundamental math here. That ~51% refers more to “Federal Aid” roadways, which includes mainly rural highways, arterial highways, and interstates. If that number still holds (note that it’s from 2013 or before), it’s referring to maintenance of about 25% of the total U.S. road network. The vast majority of traffic (and capital and maintenance cost) is on that 25% of the road network. And even if everyone took bikes and public transportation everywhere, you’d still need to maintain the other 75% of the network. It is maintained to provide access to every driveway, and is essential for bikes and for getting to your transit stop. So I don’t think it would be fair to allocate those costs to driving-only (vs. other forms of transportation). There are a lot more costs to driving than just what roads cost. There’s the cost of police, hospitals, lost productivity due to death/injuries, health effects of air/water pollution, global warming, cost of wars to secure oil supplies ($5.6 trillion and counting since 9/11), etc. Driving also affects the viability of transit by sucking away potential fares and ridership. In a world where cars didn’t exist, those 400% subsidies might not need to, either. Granted, transit can’t work everywhere but policy should greatly favor transit in areas where it does work. It should also favor denser development more conducive to transit or cycling. Part of the reason Americans drive so much is land use policies which favor sparse development, especially companies locating in greenfields. One thing I think could go a long way towards ending this is requiring companies to provide their employees with transportation to work if there is no viable public transit. This extra expense would offset a lot of the money saved by locating in the middle of nowhere. As electric cars become mainstream, which will happen big-time as soon as their cost of manufacture is below that of gas cars, the gas tax will cease to become a viable means of paying for roads. We’ll have to think of either tolls or VMT taxes. Go ahead, add up all the supposed unaccounted-for external costs of driving that are foisted upon society, and divide by the total distance driven. I almost guarantee you, you will still arrive at a small fraction of $.60/mi. That 25% is generally built to much higher, more expensive standards than the other 75% due to the need to carry heavy trucks and also due to much higher operating speeds. Pavement designed to be driven over at 80 to 100 mph has to be a lot smoother than 25 to 40 mph local streets. That costs a ton of money. Highway interchanges also cost a ton of money compared to regular intersections. While I have no figures, when all is said and done I wouldn’t be surprised if that 25% of the road network cost a few multiples of the other 75%. Remember especially on the east coast, that local street network existed and was affordable even in the 19th century when governments had a lot less money to spend. Transit has externalities also, although generally far less than driving. Really, the best solution is to just travel less. Planners should focus on this as their primary goal. Just getting anyone who has a job amenable to telecommuting to do so could result in enormous savings. That’s what I said… most of the cost is in the high-speed high-capacity 25%, which is allocated solely to driving mode, and which we’ve determined subsidizes driving about 5%. The rest costs much less, is probably more highly subsidized, and is needed for all transportation modes. I really don’t know where to get reliable statistics on that first point, though I think we can tease out it’s about 75% of the traffic ends up on federal aid highways. But it’s also rather besides the point; as you say, it’s all “needed” under the present regime, and likely most journeys involve some of both. However, under a saner transport regime you’d need a lot less road, what road is needed would be less maintenance-intensive because transit would be taking more of the burden. I wouldn’t call the rest “subsidized”. It’s just paid for via local income, sales, and use taxes which everyone pays, as opposed to gas taxes which only drivers pay. It’s only subsidized if you think only motorists should pay for local streets. Everyone uses local streets, so everyone should pay for them. I really have no problems with that. My only problem is that space on local streets should be allocated to other road users more fairly because they help pay for the roads. The biggest giveaway to motorists in this city is free curbside parking. It’s all “needed” under any regime. Every building needs access to the street network. This was just as true 100 years ago, 200 years ago, as it is today. Technically we all have been abusing the word “subsidized” for years. Neither roads nor transit are strictly “subsidized” in the dictionary sense. Both are owned an operated publicly, which is kind of different. Ironically, it’s also the high-capacity stuff that is more directly accounted for that is the least efficient and thrusts the most cost burdens onto others, including non-drivers. But 200 years ago 0% of buildings needed access to a limited access highway, and nowadays I guess you can make a kind of pedantic argument that 100% do, at least indirectly. True but not really relevant to the conversation. Access to the limited access highways (eg highway interchanges) is paid for through state and federal highway funding, which we’ve determined is 50% subsidized and contributes to the 5% subsidy on the overall cost of driving. I don’t know what the “5% subsidy” is, but that line of reasoning seems a bit on the spurious side when you consider the totality of the rest of the roads contributing to the surface transportation cost something nontrivial and contribute enormously to the usefulness of the system – though they also burden it. Not traveling long distances so much would be helpful. Once you can justify a frequent-ish transit system, an additional rider usually isn’t adding externalities. An additional car is always incrementing them. One more thing to add here. Let’s assume the bulk of driving cost is borne by the driver. The money spent on driving, if we assume an average of 10,000 miles per year, comes to $6,000 annually. If driving wasn’t necessary, a lot of that $6,000 would be spent on other things, perhaps with more economic benefit. Basically, what I’m saying is that there is an economic opportunity cost for the money spent of driving which is hard to estimate, but certainly substantial. A hundred years ago, the built area was more compact and the ratio of economic activity to linear infrastructure costs quite different.